A new technology that simulates tumors has been shown to perform as well as research animals in testing chemotherapy drugs, representing a potential tool for screening drugs before treating a patient. A long-term goal is to incorporate biopsied cancer cells from patients and test the effectiveness of different drugs on the patient-derived cells, said Bumsoo Han, a Purdue University professor of mechanical and biomedical engineering. "There are many different types of chemotherapy drugs, so clinicians may be able to narrow down which ones are likely to be more effective than others," he said. "Successful drug delivery and overcoming drug resistance are the primary clinical challenges for management and treatment of cancer. 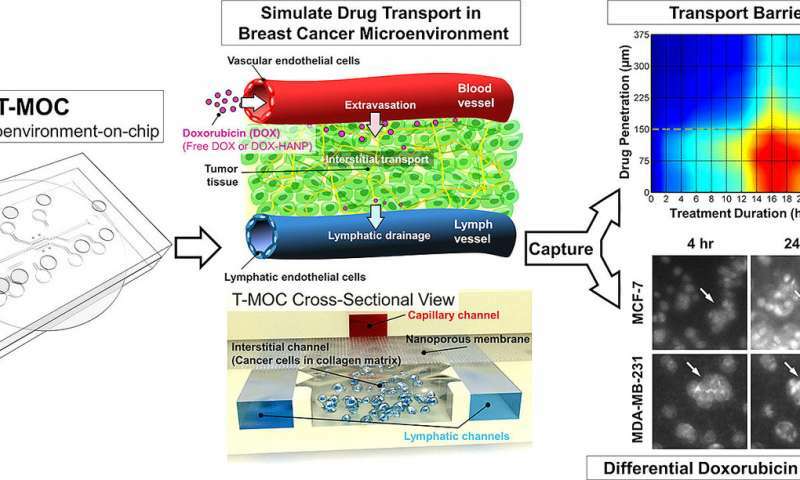 To address this problem, we developed the tumor-microenvironment-on-chip (T-MOC)." The device is about 4.5 centimeters (1.8 inches) square and contains "microfluidic" channels where cancer cells are cultured within a three-dimensional "extracellular matrix," a scaffold-like material found between cells in living tissue. The experiments also incorporate "interstitial ﬂuid," which is found inside tumors and is thought to be a barrier to drug delivery. Such a tool could be used for "precision medicine," in which drug treatment is tailored to individual patients and certain cancer types. Drug resistance and various subtypes of tumors represent critical bottlenecks for effective chemotherapy. Cancer cells produce multi-drug-resistant proteins that pump the anti-cancer drugs out of the cells, helping them survive chemotherapy treatment. The research aims to develop a drug-screening platform to mimic these multiple-drug- resistance mechanisms, as well as to validate the findings against the current gold standard, research with small animals, Han said. New research findings were detailed in a paper to be published in November in the Journal of Controlled Release. The paper's lead author is Purdue postdoctoral research associate Altug Ozcelikkale. The researchers used the common chemotherapy drug doxorubicin and also tested the difference between doxorubicin in conventional form versus a nanoparticle drug-delivery formulation. The paper was co-authored by researchers affiliated with Purdue's School of Mechanical Engineering, Department of Comparative Pathobiology, Center for Cancer Research, Weldon School of Biomedical Engineering and Birck Nanotechnology Center; Indiana University's Department of Pharmacology and Toxicology; and the Biomedical Research Institute at the Korea Institute of Science and Technology. A listing of co-authors is included in the abstract. The researchers previously demonstrated that the T-MOC device was able to distinguish different types of cancer cells. In the new findings, the team showed that the T-MOC performed as well as research mice in testing the effectiveness of anti-cancer drugs on two types of breast cancer cells, called MCF-7 and MDA-MB-231. Moreover, the molecular mechanism of doxorubicin resistance was consistent with that of mice, Han said. The findings also showed that the T-MOC is able to simulate "plasma clearance," a body response in which anti-cancer drugs are filtered by the liver and kidney, allowing only a small quantity to reach the tumor. Both cell lines cultured on the T-MOC showed increased resistance to the drugs compared to cells cultured on a standard flat petri-dish culture, matching the results with mice and suggesting a more true-to-life result. "This confirms T-MOC's predictive ability for in-vivo drug response," Han said. "This initial characterization of T-MOC indicates its transformative potential for testing drug effectiveness." Future work will expand the research into different cancer types including pancreatic and prostate cancers.